We’re talking about dollars and cents here. Recently, our friend Kaika made a compelling case against cosplayer exploitation on her blog, ‘The Cosplay Chronicles‘, and it echoes many of our sentiments about the sordid state of affairs on this little red dot. All too often, commercial entities attempt to inveigle cosplayers, especially novices fresh to the scene, into working gigs that have little or no relation to cosplay, minimal publicity (in fact, cosplayers are the publicity), and generally no community value. Kaika’s already discussed why you, as a cosplayer, should be paid, so we’re not going to delve into that. We’re going to delve instead into how much you should be paid, and why you, as a cosplayer, have the right to negotiate. Let’s face it. The value of cosplay as a marketing tool has grown exponentially over the years. With the sudden explosion of pop-culture into the public consciousness in the past 5 years, it’s become increasingly apparent to corporations that there’s money in cosplay. There are a multitude of road shows, trade fairs and retail events out there that tap on the pop-culture demographic. If you want to sell geeks your goods, you’ve got to give them what they want, so to speak. It’s also no secret that Singaporeans are drawn to spectacle, and cosplay is spectacle, no? Parade an EVA, Gundam, or hell, a guy in a full suit of armor down Orchard Road, and you’re bound to turn heads, that’s for sure. So what does this mean? It means that cosplayers have value. Whether you’re distributing flyers, generating what marketers call ‘eyeballs’, or even making up the numbers for a street parade, you’re generating income and publicity for corporations worth thousands (sometimes more). The thrust here, cosplay friends, is to understand that. It’s easy for a company to use honeyed words like “promoting Japanese culture”, “expanding your portfolio”, or even “showcasing your talent” to reel you in, but is it really? Are you gaining any tangible benefits from sweating it out in the hot sun, indulging the public and doing your part for days on end, and all for a measly shopping voucher that can be used only at a selected mall and a certificate of participation? I think not. Sure, cosplayers aren’t paid models, but the concept of remuneration, of reimbursement for your time, travel and laundry expenses shouldn’t be alien to you. If pop-culture’s being commercialized, then it’s only natural that you, as cosplayers, should learn to monetize your hobby, no? So yeah. We’ve been rambling a little bit, but the bottom-line is, all companies have money. They would have folded otherwise. It’s just a matter of you pushing the right buttons and getting past their “No budget” spiel to ensure that you’re given a fair deal when they tap on your unique qualities and talents. Here’s an example. One of our friends was recently offered $90 to make an appearance in a robot suit at an upcoming event, when the going rate for everyone else is $20 (several others were offered $60 for armor appearances). Said friend turned down the offer as a matter of principle, but that goes to show how some stakeholders can and will pay, if they need you desperately enough. And one way to get them to pay is to standardize rates across the board. Consider a minimum sum per appearance, say maybe $30 per hour if you’re wearing a less elaborate costume, and maybe $50 per hour if you’re in armor or clad in a robot suit. If every cosplayer’s making the same demands, then sooner or later, corporations are going to have to wise up, or hire models who masquerade as cosplayers (as if that’s not already happening), put them in tacky costumes, and pay an even bigger premium. It might sound idealistic, but hey, it’s one way to ensure that you’re not being gypped, and that you’re not being worked to the bone for scraps, right? 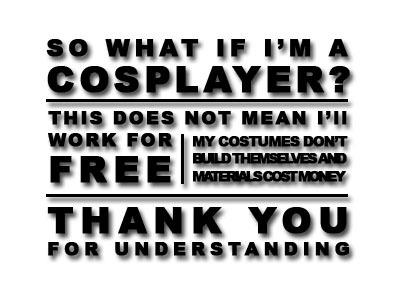 Think about it, and if you agree with us, tell your cosplay friends, spread the word. It’s time us cosplayers stood together and made a stand. Vote for us in Singapore Blog Awards 2012! If you liked this post, and you think we can make a difference in the Singapore cosplay scene, please do vote for us in the Singapore Blog Awards! Your continued support will go a long way towards helping us realize this and our win would provide us with a platform to push for more ethical treatment of cosplayers. 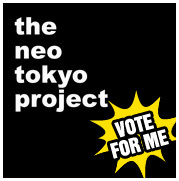 You can do so simply by clicking on the ‘Vote For Me’ button, or on this link now.